After their matter-of-fact repeat of Defenders of the Faith (IX,9) last Tuesday, Greg Boswell and Will Sim spent several days at the CIC Hut with James Dunn. Their stay coincided with last week’s great storm, but they did manage an ascent of The Great Chimney (IV,5), in the relative shelter of the east side of Tower Ridge. Whilst I phoned Robin Clothier (CIC Custodian) and Andy Nisbet (SMC President) to give them the bad news, Greg, Will and James attempted to descend, but had to retreat back to the hut. Their persistence paid off, because Friday December 9 dawned still and clear, and the trio made their way up deep snow to Number Three Gully Buttress. They climbed the complete summer line of The Knuckleduster, a summer HVS first climbed by Jimmy and Ronnie Marshall in summer 1966. The route was first climbed in winter by Steve Ashworth and Blair Fyffe in February 2007, who finished up Sioux Wall, but Boswell, Sim and Dunn stayed independent and climbed the steep final summer pitch. For more details and pictures of the damaged CIC Hut take look at Greg and Will’s blogs. 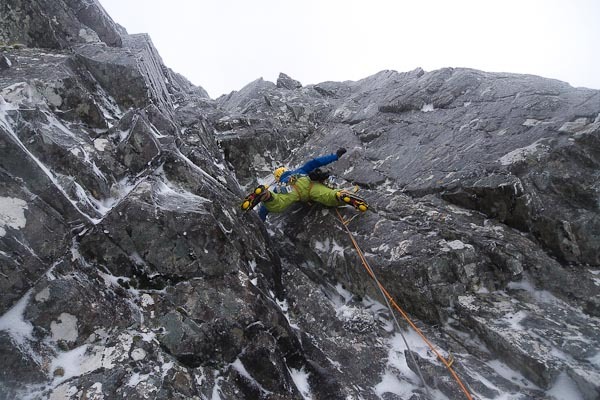 This entry was posted in Repeats and tagged Ben Nevis, Greg Boswell, James Dunn, Will Sim. Bookmark the permalink.